The provincial government and Providence Healthcare announced plans this morning to build a new $1.2 billion hospital at the False Creek Flats and close existing facilities at the historic Burrard Street site. This confirms renewed speculation earlier this month that the government and the healthcare provider had canceled their plans to renew the project on the site. 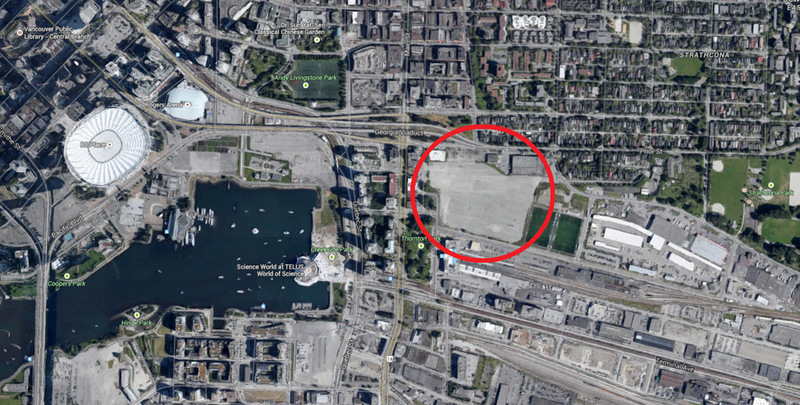 Under the new plan, a new one-million-square-foot hospital will be built on a vacant site on Station Street, immediately north of the Pacific Central railway train station and near SkyTrain’s Main Street-Science World Station as well as a number of north-south bus routes. Partners in the project purchased the site in 2004 with the intention of reserving the site for a future hospital. Since then, they have paid $800,000 annually in property taxes to retain the option of building the new facility. The new state-of-the-art False Creek Flats hospital campus will utilize the 18.5 acres available at the site for the hospital expansion, a substantial increase in footprint from the 6.5 acres at the Burrard Street location. Hospital facilities at the new site will include 700 beds – a considerable increase from the 435 beds at the existing hospital on Burrard Street. The capacity of the new hospital will be comparable to the recently expanded Surrey Memorial Hospital, which has 650 beds, but it will be smaller than Vancouver General Hospital’s 1,000 beds. All facilities currently found at the existing St. Paul’s Hospital will be relocated to the new site. This includes the emergency room, research and teaching programs, surgical services, community care and outreach, with the addition of a seniors’ care centre, a mental health and addiction program, and a low-risk birthing centre. There will also be a 24-hour primary care clinic, a new program for patients with minor health issues that will reduce wait times at the emergency room. Social housing developments could even be an option to pursue given the size of the hospital development site. A single Patient Intake Centre building at the hospital’s main entrance will consolidate admissions patient flows and improve efficiency with clearing patients prior to providing additional services. To help fund the project, the St. Paul’s Hospital site on Burrard Street will face a full closure for redevelopment. At this time, there are no plans to retain a level of essential healthcare service such as an Urgent Care Centre at the existing location, which was part of the original 2008 plan and has now been deemed unfeasible. While the original relocation plan aimed to replicate the facilities found at St. Paul’s Hospital, the new iteration of the False Creek Flats hospital will be significantly more ambitious. Providence Healthcare will use the sale or lease of the downtown core city block to help raise its share of the project. This adds to the provincial government’s 2012 commitment of contributing $500 million to a hospital renewal project. Construction could begin in 2017 for an opening as early as 2022. The existing hospital will remain open until the new facility is ready to receive patients. Community consultation is scheduled over the span of the next year, particularly with West End residents who have been vehemently opposed to a relocation of the hospital. In 2010, neighbourhood opposition led then-Minister of Health Kevin Falcon to cancel the relocation project in favour of an $850-million renovation and expansion on Burrard Street. But the healthcare facilities serve regional and provincial needs as well, with 50 per cent of inpatients arriving from outside Vancouver, and the new hospital would only be a few minutes away from the current site. More importantly, the existing site has been plagued with safety and maintenance issues. Just one building on the entire campus is built with fire sprinklers and several buildings are about 100 years old and would require an $80 million seismic retrofit to bring the structures to a minimal seismic drift capacity. Currently, the original Burrard Building has a seismic capacity of just 10 to 20 per cent of building codes. For operational purposes, the facilities at the existing site are inefficiently spread out across multiple buildings and levels. For instance, the radiology department is located an equivalent distance of two city blocks away from the emergency room. A renewal of the existing facilities would prevent the full implementation of single patient rooms, a new worldwide hospital standard that prevents cross infection, decreases length of stay and lowers operational cost. About 48 per cent of the beds at St. Paul’s Hospital could be transformed into single patient rooms while the construction of a new False Creek Flats hospital enables a “clean slate” for designing a modern hospital layout. Providence Healthcare approached the provincial government four months ago to resurrect the original relocation proposal due to the benefits of working with a fresh start. A reconstruction of the Burrard Street location could take many years as it would need to be done on a phased, piece-meal process whereas the site at the False Creek Flats could be built in five years. The new location on the fringes of the downtown Vancouver core would better serve the city’s underserved populations in the eastern suburbs and help revitalize the neighbouring Chinatown neighbourhood. “The new St. Paul’s and integrated health care centre will be designed in a way that puts the patient at the centre of care,” said Dianne Doyle, President and CEO, Providence Health Care.